Unfortunately @ZabelRick crashed hard today in training on a bike path. Diagnosis: broken collarbone. He will be operated tomorrow in Cologne. Get well soon, Rick! Rick Zabel, much worse for the wear. 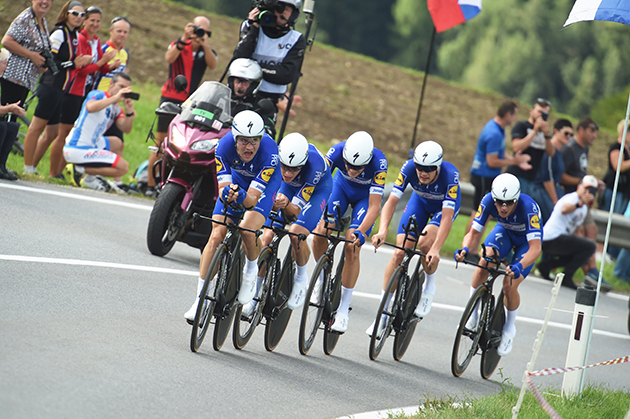 Quick-Step Floors CEO Patrick Lefevere looks back at a record-breaking 2018, a year that saw his outfit win the UCI World Tour Team Classification and continue its impressive streak as the most winning team in the world for a seventh season in a row. I couldn't have dreamt about the 2018 season we have enjoyed. Nobody could! It is very much a once in a life time experience, which I'm afraid I don't have a fancy name for, like last year, when I named it Grand Cru Classé Exceptionnel. It's truly extraordinary what we have achieved and the whole squad is part of this success. It's a fantastic proof of what you can accomplish through team spirit, hard work and dedication from everybody involved and an unstoppable motivation to win cycling races. Topping the UCI World Tour Team Classification for the first time in history of Quick-Step Floors with a total of over 13,000 points and such a hefty advantage is a culmination of all these things I have just mentioned and an achievement that gives me great pride. You will probably find me repeating myself but I can't stress the following enough: we lifted our arms aloft 73 times this season, an all-time high for me personally, and while this, in itself, is an outstanding achievement, you have to look not only at the massive number of victories but also on the quality. In 2018, we became World Team Time Trial Champions, across the three Grand Tours we took 13 stages, two distinctive jerseys and finished on an overall podium, we won multiple National Championships and brought home two monuments – Ronde van Vlaanderen, for a second year in a row, and Liège-Bastogne-Liège, for a first time with our current team constellation – and in-between all of these triumphs, we succeeded in classics like E3 Harelbeke, Flèche Wallonne, San Sebastian, Cyclassics Hamburg and many more. One of my personal highlights was the victory in the Worlds TTT, in Innsbruck, the very last edition for trade teams. If you look at the video from the hot seat when we realize that we have set the fastest time, thus securing a record fourth TTT Worlds title, you will understand the emotions of such a victory, shared by the whole team, staff and riders alike. It is a discipline that means a whole lot to me and everybody involved on the team. Over the years, we worked hard, always trying to improve ourselves while being quite good at it as well. We saw some teams give up on it while other teams worked harder, like we did, which made for many good fights between us and a handful of other squads. As team, we are very much driven by the exercise of developing ourselves on every level, looking for improvements across figures like our riders' program, training, nutrition as well as the technology that goes into running as world class cycling team, including clothing, bikes, equipment, vehicles, tools and so on. The TTT is in many ways the ultimate display of all these things coming together, a test of raw power, the right mixture of riders, technique, tactic, equipment, setup and performance on the day. Thus, to win the title is the ultimate triumph for a team, its staff and sponsors, believing in our vision. We saw already last year the young guys coming out of our former development team Klein Constantia adapting very well to the team and the World Tour level, thanks to a fundamental education, a well-planned season and careful treatment, allowing them to develop and perform under no pressure while at times playing important and free roles during the season. But to say that I had expected such an incredible performance from so many of our young guys in 2018 wouldn't be entirely true. Watching Alvaro Hodeg and Fabio Jakobsen step up on the biggest scene to win 12 times together (including on the World Tour) is quite the season for two young neo-pros. No one can and should expect that. We went to the Vuelta a España with an expectation that Enric could do well, perhaps go for a stage victory and a top 10 in the GC. 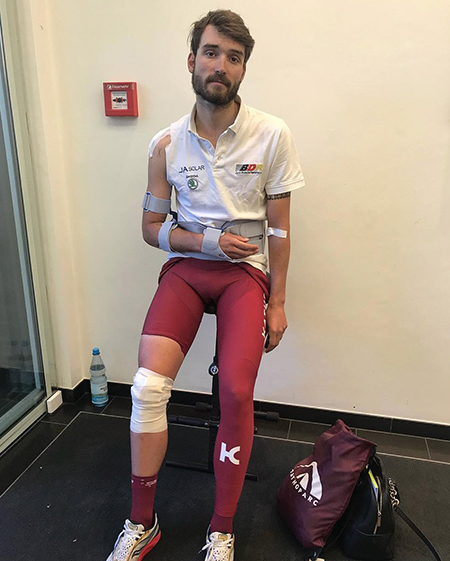 As the race progressed, we saw how he became stronger and helped by a team that stayed around him, he finished off by winning the queen stage and being rewarded on the podium in Madrid as runner-up in the general classification and best young rider of the race. This season also offered a room to be filled by guys like Bob Jungels, Julian Alaphilippe and Yves Lampaert, all riders in their mid 20's on the verge of breaking through as true winners. I am pleased to see how they took on and lived up to the responsibility this year. What makes me proud is that more than half of the riders put their name on the list of winners. However, the honour belongs not only to them but to everyone on the team who has been putting working with pride and dedication, sometimes day and night, to achieve these results. While we can still look back on 2018 and take a moment to appreciate what we achieved, our preparation for 2019 is looming on the horizon. Unfortunately, we will have to let go on a handful of incredible riders, who have meant a lot for the team and its success over the years, but it won't change who we are. It will be exciting as ever with two new sponsors coming aboard, Alken-Maes and Deceuninck, the latter joining as new name sponsor and we're determined to continue were we left off. 2018 shouldn't hang over our heads like a phantom in 2019 and if people will compare us with this season, we simply won't be listening. Instead, we will do as we did this season and have done since the inception of the team: We will give our everything in order to be one of the best teams in the world. There is always room for improvement, to become better, if you pay close attention, so we will continue to reinvent ourselves to stay on top. ALMERE, The Netherlands – After making an all-out effort to take-over all Accell Group’s [Raleigh, Diamondback, Redline & others] shares in April 2017 which in the end failed, Pon is again knocking on Accell’s doors. Today, the holding company of various (automotive) import companies as well as Pon. Bike Group announces that it intends to acquire a 20 percent shareholding in Accell Group. For that Pon announces that it offers 19 euro per Accell share.